When I was eleven, I had virus pneumonia and whisperings around me let me know people wondered if I might die. I coughed a lot, grew emaciated and hollow-eyed. When my parents took me to a doctor, he started me on penicillin injections weekly for a while. I was told not to carry my baby brothers under any circumstances, just rest. Any eleven-year-old is going to get tired of that kind of life, especially since my treatment was to be for three whole months. For the first time in my life, I knew boredom. It was probably the only time I could not look around and figure out something to do. Bless my mother’s heart; she figured out that I might be less bored if they moved my bed out under a shade tree in the back yard. Two Collie dogs, several barn cats and a yard full of chickens came to investigate the new situation, and I talked to them for pastime. My daddy’s aunt also brought a crochet book called LEARN HOW, a few hooks, and some cotton thread. I was ecstatic. I lay there and read and practiced and re-read the whole three months. 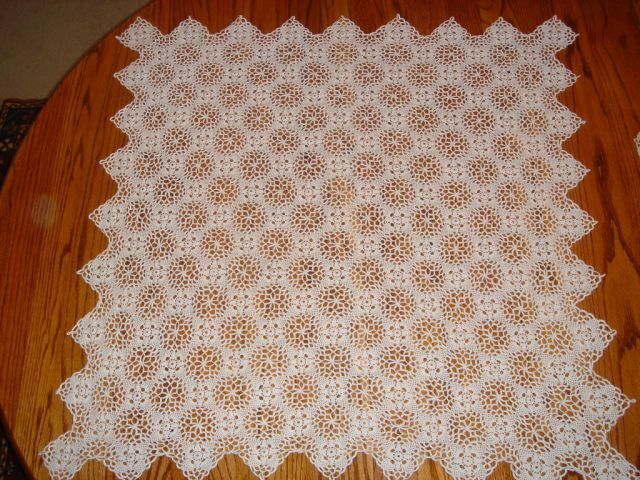 I made quite a few small things like doilies, table runners, coin purses and collars, but I knew one day I would do more. And so I have. During my young motherhood, I made countless baby sweaters, hats, blankets, and shawls. More recently I began to try to help others to learn how to crochet too. Some of my largest projects were created by those I was teaching. 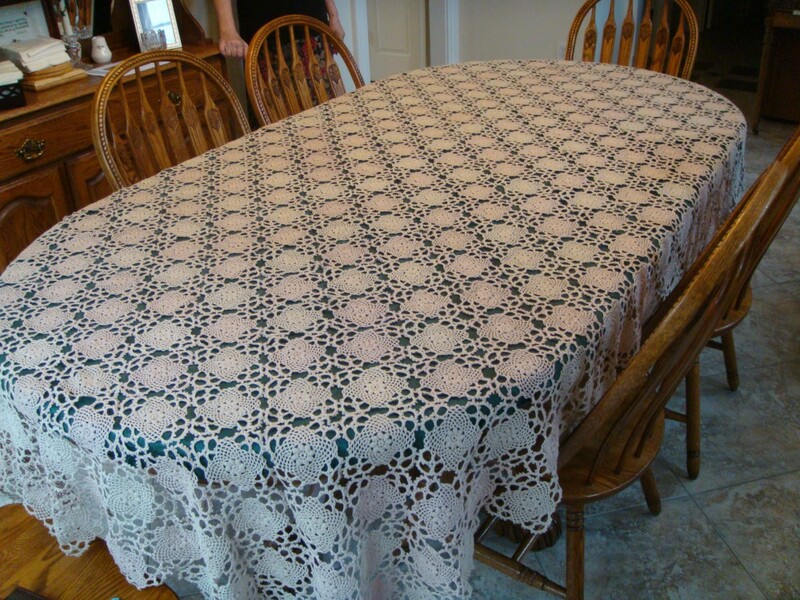 I have uploaded photos that show some of that work — the hand-made table cloths. Either I have made or helped others to make several of these labor-intensive products. These were used as gifts for our grandchildren when they married or gifts to our children for no particular reason other than the fact they were loved. My computer has crashed multiple times in the last few years, so I can only find a few of the many I have given out. 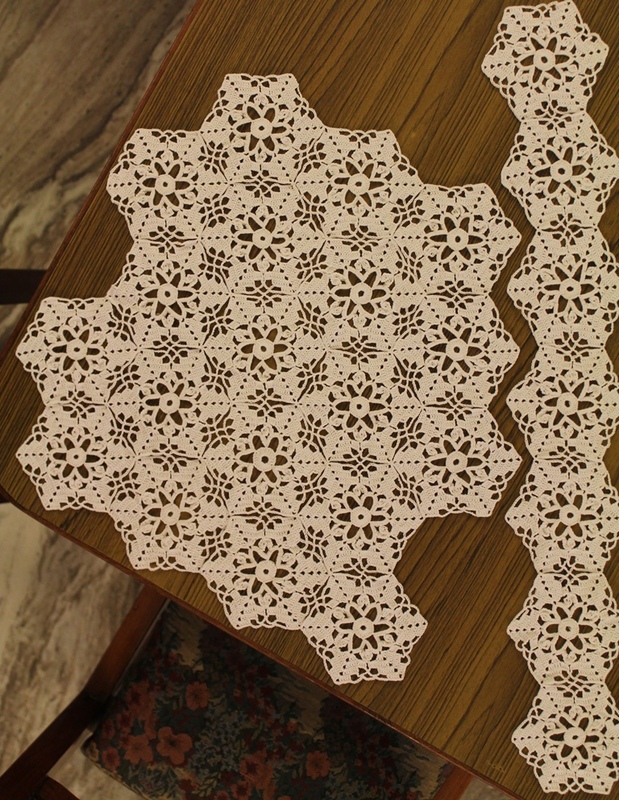 The first picture shows a lacy pattern that was easy enough to do, but not easy to put together for some reason. The next photo shows a smaller table covering meant for a side table or entry way table. It was made with size 30 thread–very tiny indeed. It should have been made into a table runner, and it would have been more useful. Someone at our elder son’s house caught me “tying loose ends” on this one. Funny how that phrase fits so many things in my life. This cloth was a special request from our daughter-in-law who liked the ecru rather than the white thread. This one is #10 weight, and you can see how heavy it looks compared to the one above. The heavier thread is the choice of most ladies learning to work with crochet patterns and is equally as useful for bedspreads as it is for table cloths. 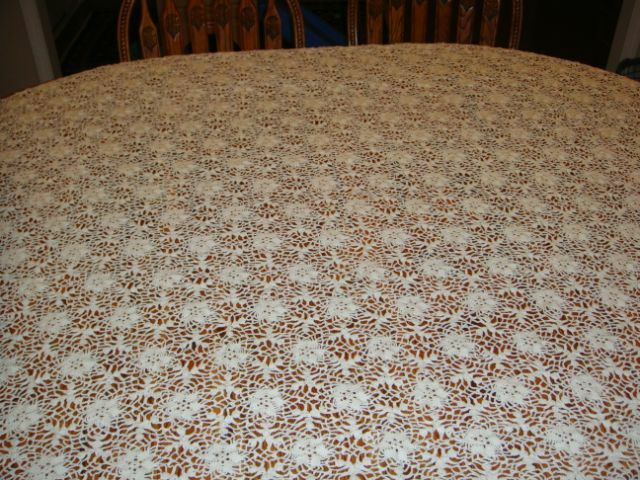 The next photo shows this same tablecloth in full view. It is sturdy and stylish too–very versatile and oh so special for company dinners. Finally, I want to show you a new project I have begun. 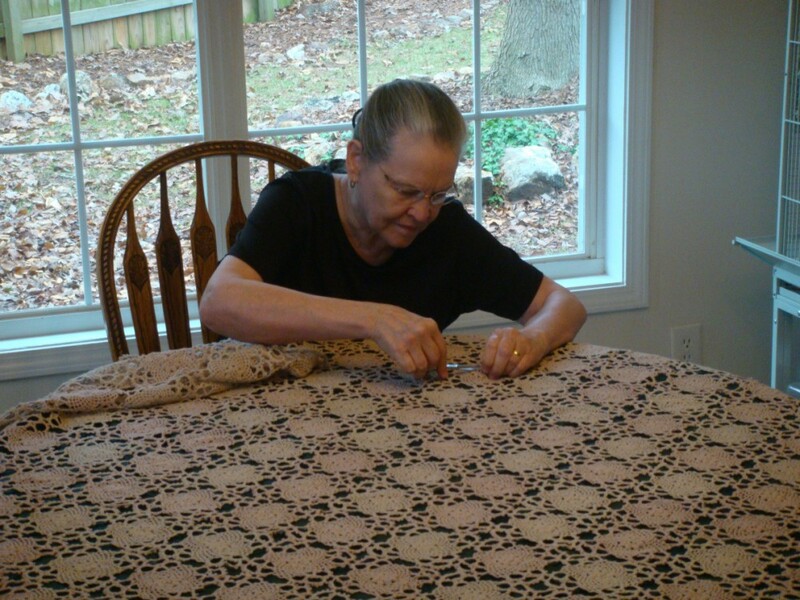 In this picture, I am at my kitchen table trying to see which method of joining the motifs is faster. I can use the “line-at-a-time method” or the “whole cloth method. ” Perhaps both will work about the same. Time will tell. Personally I would really love to learn how to make clothes. I honestly just have not had the time. I did a complete revamp of my business site today (widgets, template change, the works) and when commenting now I completely forget that my Gravatar was part of the revamp! So is your avatar a Siberian Husky? Our youngest daughter has one that is truly a beautiful animal. Making clothing these days is harder than it was when I was younger. In the early years patterns were quite detailed and designed to be used for multiple body shapes. These days, you pretty much have to know what you are doing before you cut and sew. There is almost a flat learning curve unless you know how to use the curved stick. I was blessed to learn the Bishop Method of clothing construction before bought patterns went all wimpy. I was reading from your blog this morning and found a piece about the rain. I totally agree that rain can be relaxing and beneficial. Whereas most want to grouch and complain, it would be far better to have a positive outlook about it. Growing up on a large farm helped me to appreciate rain for several reasons. First of all, it meant a day off from work and I could read or sew or the myriad things I wanted to do in the house. Second of all it made me happy because crops would grow better. Even here in India, I do not mind the monsoons unless there is a cyclone. Monsoon weather is cooler by far and animals and houses get a bath. These tablecloths are beautiful, Beth, and it is helpful to have another picture of you, at work. The image of the message–as you see it–is also helpful as a way of letting us see things from your perspective. “Tying up loose ends”–perfect. The more I try to focus on some things, the more frustrated I become. Cataract surgery was supposed to solve everything, but it hasn’t. I need to thank God every day (several times a day) for what he has given me and think like Job, when he said, “…Naked came I out of my mother’s womb, and naked shall I return thither: the Lord gave, and the Lord hath taken away; blessed be the name of the Lord” (Job 1:21).